USA: Dinoship, Inc., 2005, PB. Order it from: Amazon.com or Amazon.co.uk. This is the first American collection of Kim’s Short Stories. It features: ‘A Drug on the Market’; ‘Tomorrow Town’; ‘The Original Dr Shade’; ‘Famous Monsters’; ‘Organ Donors’; ‘Going to Series’; ‘Angel Down Sussex’; ‘Dead Travel Fast;’ ‘Amerikanski Dead at the Moscow Morgue’; ‘The Big Fish’. UK: Millennium Books, 2000; PB. This novelette contains the short story ‘Andy Warhol’s Dracula’ by Kim, and ‘The Vaccinator’ by Michael Marshall Smith. “The vampire in the white suit hooked her attention too. For a moment, she was sure it was him, come back yet again, young and lethal, intent on murderous revenge. UK: Pocket Books, 2000; PB. The introduction is written by Eugene Byrne, and it contains: ‘Amerikanski Dead at the Moscow Morgue’; ‘Dead Travel Fast’; ‘Further Developments in the Strange Case of Dr Jekyll and Mr Hyde’; ‘Great Western; The Germans Won’; ‘Just Like Eddy’; ‘Residuals’; ‘Slow News Day’; ‘Teddy Bears’ Picnic’; ‘A Victorian Ghost Story’. UK: An Alchemy Press / Airgedlamh Publication, 2000; HB. This limited edition hardback volume collects all four of the “Where the Bodies are Buried” stories. The introduction is written by Peter Atkins, with the cover by Sylvia Starshine, and interior art by Randy Broecker. Each copy is signed by all contributors. 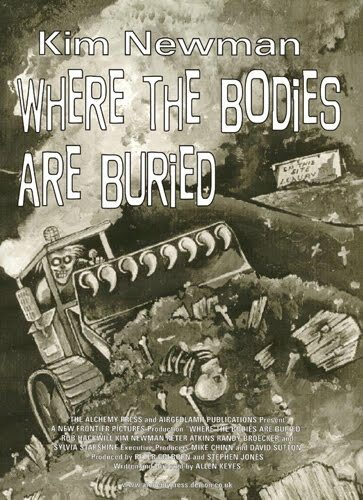 It contains: ‘Where the Bodies Are Buried’; ‘Where the Bodies Are Buried II: Sequel Hook’, ‘Where the Bodies Are Buried 3: Black and White and Red All Over’; ‘Where the Bodies Are Buried 2020’. USA: Mark V Ziesing, 1997; HB. Order it from Amazon.com or Amazon.co.uk. This novel is composed of several alternate reality stories set in a world where America had a revolution, and Russia didn’t. Welcome to the United Socialist States of America. Co-written with Eugene Byrne. It contains: ‘Abdication Street’; ‘Citizen Ed’; ‘In the Air’; ‘On the Road’; ‘Ten Days That Shook the World’; ‘Teddy Bears’ Picnic’; ‘Tom Joad’. It has an introduction by Paul McAuley, and contains the following stories: ‘The Big Fish’; ‘The Blitz Spirit’; ‘Famous Monsters’; ‘Out of the Night’, ‘When the Full Moon is Bright’; ‘The Pale Spirit People’; ‘The Pierce Arrow Stalled, And…’; ‘Pitbull Brittan’; ‘A Quarter to Thre’; ‘Ratting’; ‘The Snow Sculptures of Xanadu’; ‘Three on a Match’; ‘Ubermensch!’; ‘Where the Bodies Are Buried’; ‘Where the Bodies Are Buried II: Sequel Hook’. I pushed the door and found myself in the temple’s waiting room. It was what I’d expected: subdued lighting, old but bad paintings, a few semi-pornographic statuettes, a strong smell of last night’s incense to cover the fish stink. It had as much religious atmosphere as a two-dollar bordello. With an introducation by Neil Gaiman. It contains: ‘D&D’; ‘Dreamers’; ‘Gargantuabots Vs the Nice Mice’; ‘The McCarthy Witch Hunt’; ‘The Man Who Collected Barker’; ‘Mother Hen’; ‘Mrs Vail’; ‘The Next-But-One Man’; ‘Organ Donors’; ‘The Original Dr Shade’; ‘Pamela’s Pursuit’; ‘Patricia’s Profession’; ‘SQPR’; ‘Twitch Technicolor’. Sally knew from experience and The Rockford Files that nothing was as simple as the commission she had accepted. She was being followed. Steve Antczak, Barrington Bayley, Stephen Baxter, Scott Bradfield, Jonathan Carroll, Ray Davis, Greg Egan, Christopher Fowler, Colin Greenland, Peter F. Hamilton, Gwyneth Jones, Cliff burns, Graham Joyce, Marc Laidlaw, Jonathan Lethem & Lukas Jaeger, Ian R MacLeod, Ian McDonald, Alastair Reynolds, Nicholas Royle, Lewis Shiner, Steve Rasnic Tem, Mark Timlin, Lisa Tuttle, Ian Watson, Don Webb, Andrew Weiner, and F. Paul Wilson.